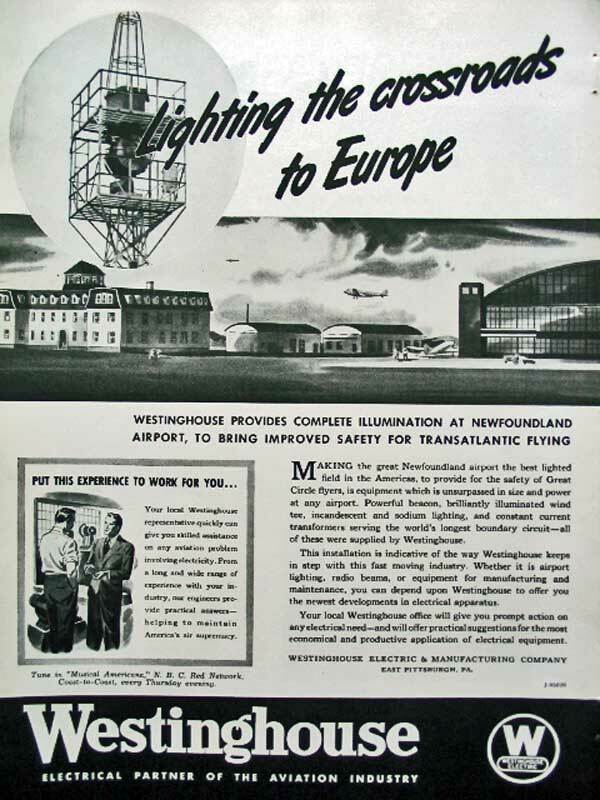 This is a magazine ad from early 1940, promoting Westinghouse products by making reference to the modern equipment, based on the latest technology, previously installed at what was then called Newfoundland Airport. Mr Fred Chafe in discussion with Carol Walsh spoke of his arrival as an electrician in Gander on 27 October 1937. The very next day he had the chance to meet the fellow looking after the runway related electrical installations. His name was Bob Schwarmer who was there from Westinghouse, installing the field lighting set, beacon, wind tee, control desk and switchboard. Thinking that these Westinghouse products would most likely have come from St John’s, a research in the Evening Telegram and Daily News revealed interesting information. This is from the Daily News “End of year review“ of Saturday December 31st 1938. It would appear therefore that the building of the Crossroads of the World was beneficial not only to air travel. In that period near the end of the Dirty Thirties, it benefitted as well to workers who came from all over Newfoundland and to businesses from Port aux Basques to St John's.